Join the discussion on our forums! Come discuss Cryomancer over in our dedicated Cryomancer discussion topic. Battlecry: If an enemy is Frozen, gain +2/+2. I've had minor success with this, in a weird Midrange Mech Mage deck that runs Snowchugger, Clockwork Gnome, Tinkertown Technician, Mechanical Yeti and Kabal Chemist. It works pretty well with Emergency Coolant, and can make use of Freezing Potion from a Kabal Chemist lowroll. I think this card would actually be playable if it was a 4 mana 4/4, Battlecry: If an enemy is Frozen, gain +3/3 (or +2/2 if that's too op), so that it can be played together with Blizzard. Does anyone know where to find the full art. I've searched and searched but can't find it! The wiki usually has it, below the BB code and above the deck statistics there is a "See this on our wiki" link that has the full art. Something weird happened just now: Playing arena, my opponent uses Frost Elemental on my Silvermoon Guardian, freezing it. Then, on my turn, the Cryomancer started glowing yellow despite the fact that there was no frozen ENEMY. I didn't play it (not wanting to risk it), so IDK if it would have triggered or not. Maybe this is some sort of really old bug, and I'm overreacting. I was actually thinking about Water Elemental instead of Snowchugger. It curves nicely and gives you the boost if you make sure Water Elemental dies by a minion / survives. The artwork looks really cool. I've had enough of these puns, I'm giving you guys the cold shoulder. FwF is also a 6 mana 7/7. Just paid in installments. As if Arena Mage wasn't already strong enough...and not a bad pick for Tempo Mage either. Sure, it might not give you more options for future turns like Ethereal Conjurer or Azure Drake, but the raw stats can give your opponent a run for their money in a lot of cases, especially if you combine this with Freezing Potion. 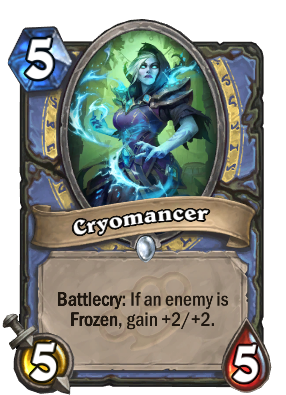 Another reason to run the new potion, Shatter, Ice Lance, oh god Here comes the new meta freeze mage. Yeah well except for the fact that this card is not good. And on top of that, Freeze mages only play utility minions for stuff like draw or spell power.